These 3 on a page checks have perforated stubs for record keeping – perfect for accounts payable or petty cash. Choose from 13 colors and 1 or 2 parts. Checks are punched to fit a 7 ring binder. When you’re using three on a page checks, you want an efficient way to keep up with them. These stylish binders, which come in burgundy, black, and blue, are already the perfect size and shape for keeping up with these checks, whether they’re waiting to be printed or have already been paid out and you only need to keep the stubs. When you’ve filled up one book, it will slide into your shelf for easy paper record-keeping, while your new book will be perfect for all of your needs. 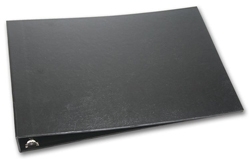 This check binder is 14” by 10” when closed and 29 ½” by 10” when open and has 7 rings. There’s nothing more time-consuming than personally endorsing each and every check that needs to go into your business account. 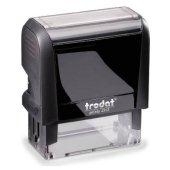 Thankfully, with this original trodat self-inking endorsement stamp, you can quickly provide all of the relevant information for each check, then move on to your next task. The stamp comes complete with a pad that re-inks after each use, making it the simplest way to endorse every check in your stack. Medium: stamp size of 2 5/8 x 1 1/8- print area of 13/16 x 2 3/4. Large: stamp size of 3 1/8 x 1 5/16 - print area of 15/16 x 2 11/16.